Caroline Cash Casino was first broadcast on 24th October 1966 and ran for 39 weeks until 10th July 1967. Altogether 13 separate contests were aired and a total of £34,980 was awarded in prizes, ranging from £460 to £4,070 (see Today’s Values). For listeners - there was the attraction of large cash prizes being offered for successfully solving clues broadcast during the daily slots which were aired each hour from 9.00am to 1.00pm (later 2.00pm). 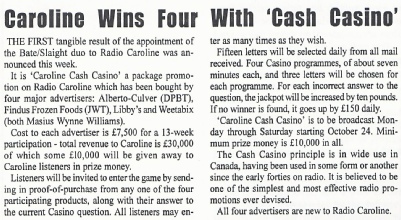 For sponsors - evidence of sales came from the requirement that listeners had to submit a product proof of purchase (usually a carton flap, can or bottle label) with their Cash Casino entries and Radio Caroline then used these statistics to demonstrate to individual sponsors the enormous success of the promotion. 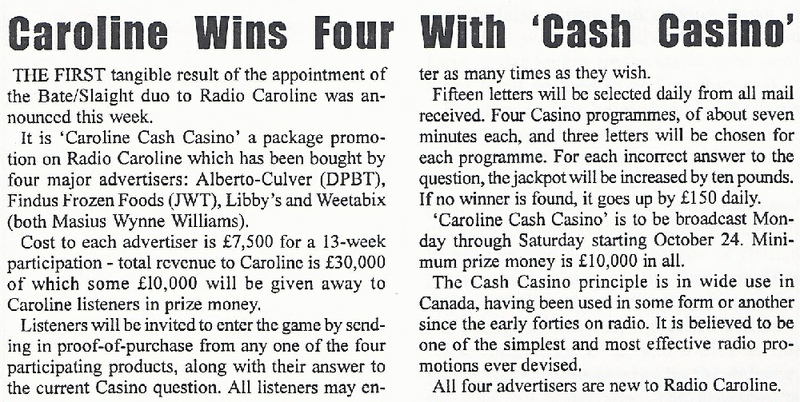 For Radio Caroline - they were able to display tangible proof to sponsors that their advertising messages were being heard by huge numbers of listeners and the station also attracted hundreds of thousands (maybe even millions) of new listeners who were ‘hooked’ on the Cash Casino competitions. The objective of Cash Casino was for listeners to identify - from clues given in the form of rhyming couplets - the name of the person or object which was being described. Each of the 13 contests in the Cash Casino promotion was started with an initial £100 in the jackpot. The Cash Casino segments, hosted by Bill Hearne, were taped at Caroline House and aired simultaneously every hour between 9.00am and 1.00pm (later 2.00pm) on both the North and South ships. Each segment had a different sponsor and a new clue was broadcast daily. 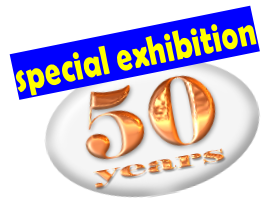 Listeners entered the competition with their guesses about who or what was being described by the clues. Answers were sent by post to Caroline House in London and each entry had to be accompanied by a proof of purchase (usually a carton flap, can or bottle label) from one of the sponsor’s products. Listener's answers were 'drawn' from entries in a mail sack for that hour’s sponsor and £10 was added to the jackpot total for every incorrect answer. The jackpot grew by £30 a segment (£150 or £180 a day) if all three answers drawn were incorrect. The first letter opened which did contain the correct answer won the accumulated jackpot prize for that contest. 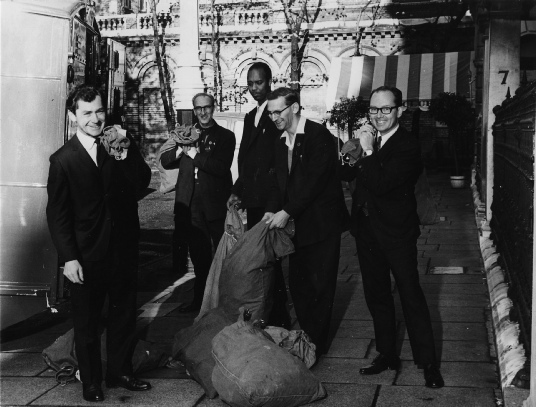 Terry Bate (left) and Alan Slaight (right) help unload a delivery of Cash Casino entries at Caroline House.